When you travel to Spain the one cultural recommendation to see is Flamenco. There are loads of options ranging from expensive dinner shows to mediocre tourist performances. To be truthful, I really didn't know what to look for, I just knew I wanted to see one and since our 11 year old daughter was with us, it couldn't last all night long. If you walk around any city in Spain long enough, you will be handed flier or see a billboard advertising flamenco which is exactly what happened to us. We walked past a billboard and decided, pretty much on the spot, with no researching, that we would kill two birds with one stone and go for the dinner/show option. We arrived for dinner at Tablao Flameco Cardenal about an hour before the show began. Dinner wasn't anything spectacular, a variety of tapas really, but the show...wow! I am not a fan of flamenco singing, but the dancing was fantastic! The speed with which these dancers move their feet is incredible. The whole team, dancers, singer and guitarist worked together in a rhythmic fashion so impressive and inspiring they had the crowd standing by the end. Technically, you're not supposed to photograph the dancers (which is why the photos are so poor), so I waited until they struck a pose before clicking. 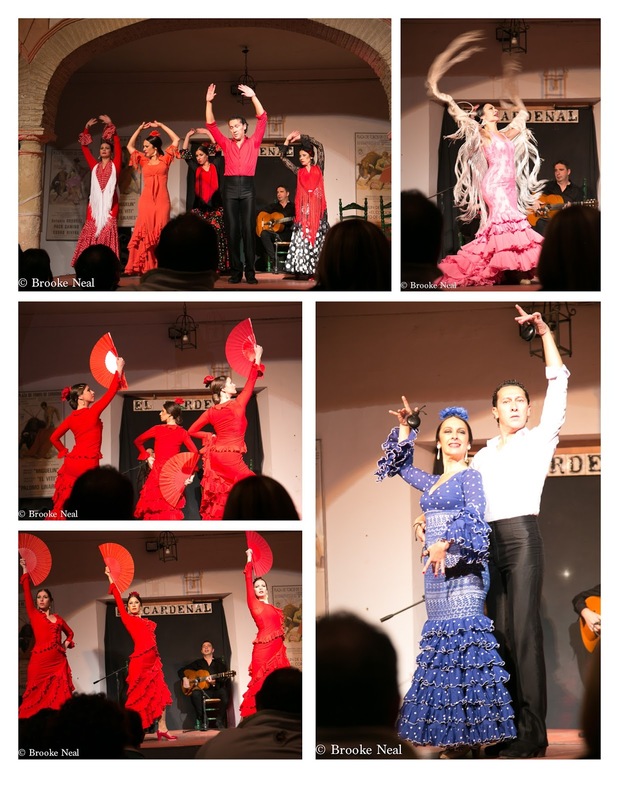 If you find yourself in Spain, do not miss taking in a flamenco show and if you are in Cordoba, check out Tablao Flamenco Cardenal--come to find out, they are #1 on Trip Advisor. There is such a thing as a flamenco singing too? I did not know that. I do like to see this show once in my lifetime because of the outfits are really nice to look at.